Leeds boss Neil Warnock described his side's dramatic Capital One Cup win over Everton as his greatest victory in cup competition. Rodolph Austin's 70th-minute strike ensured the Championship side ran out 2-1 winners in the third round against their Premier League opponents. When asked where this victory ranked in his career achievements, Warnock said: "That is probably the top cup night. "This was a top Everton side. To play like we did was tremendous." Aidan White had given Leeds the lead after only four minutes before Austin put Leeds on course for a famous victory by scrambling in with 20 minutes remaining. Everton, who started with no Englishmen for the first time in their history, were disjointed for long periods, but Sylvain Distin pulled one back nine minutes from time to set up a dramatic finish. "We scored two and could have had a few more. 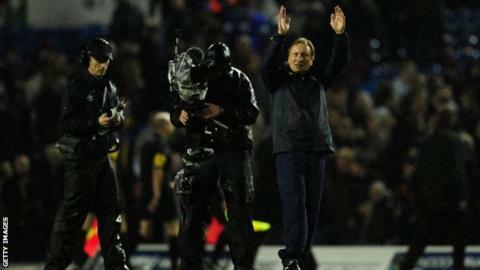 I thought we were excellent," Warnock added. "They [Everton] wanted to win it - make no mistake - but I think we deserved it on the night. I thought we were a little bit sharper, we won the second balls and I think we should have scored one or two other goals, so we're disappointed that we didn't, but we never do anything easy." El Hadji Diouf was outstanding throughout for Leeds and Warnock could not speak highly enough of the former Liverpool and Bolton forward. "He has been a revelation," Warnock said. "He is fit and getting fitter every game. "Obviously I said things about him when I didn't really know him but since he has been with us he has been a revelation. He has been good with the young lads, good in the dressing room. He has helped everybody. He makes me laugh and I make him laugh. It is a happy relationship at the moment." Everton manager David Moyes could not hide his disappointment. "We never really got started," he said. "We gave away a terrible goal in the opening minutes which gave Leeds a lot of momentum and a lot of belief." Moyes refused to accept that his decision to rest six players from the 3-0 victory over Swansea on Saturday had backfired. "When you have a squad of players you have to give them game time and play them," he added. "If you don't there is no point in calling them a squad, they are just first-team players and reserve-team players. "We have given a few a go and maybe they didn't show up like we would have wanted them to. But it was right that we gave it a go. The result was wrong, but you couldn't have said those players weren't good enough to go out and get a result."